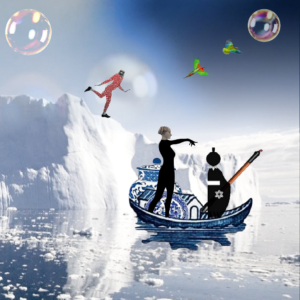 While adrift on thin icy, not knowing what to do, a strange phenomenon happened. From @foscasalvi atlas, we were able to understand their origin. Undoubtedly, they were arriving from @reginastorytelling world. Where they came from, this was understood. What to do with them, not so clear. Not being sure, @tatjana1o1 princess jumped on @cobaltbluesailor2’s boat. Ms Birdhead didn’t follow.